George Gallet was the dean of college sports information directors in this country. He served in the capacity at the University of Miami for 44 years, longer than any SID director in college history. Over the years more than 100 All-Americans, in all sports, were the handiwork of George Gallet. Gallet was the originator of the play-by-play sheets for writers and sportscasters that are now standard in every press box in the United States. Year after year his UM football book was ranked among the best in the country and many times received awards. It was no secret that Gallet was the man behind numerous ABC network television games that brought early publicity to the University of Miami. Gallet interviewed Knute Rockne, one of the last to do so, before Rockne was killed in a plane crash. 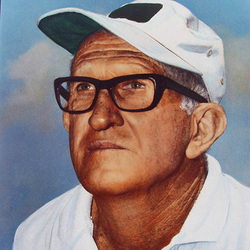 Gallet, who was inducted into the University of Miami Sports Hall of Fame in 1981, passed away that same year at the age of 71. He was starting his 45th year at Miami he suffered a massive heart attack. The Communications & Marketing Suite at the University of Miami is named in his honor.